We were up this morning at 6:30 as the ship was schedule to dock at 7:00 and we were scheduled to get off the ship 7:45. Neither of us slept well last night so we were both tired when we got up; not a good way to start a long day. We packed our last remaining things and headed off to the Neptune Lounge for our last breakfast on the ship. We then returned to our room and waited for our debarkation group to be called. Our plane doesn’t leave Fort Lauderdale until around 7:00 tonight so we have a lot of time to kill today. To pass some time we signed up for a ship airport transfer that include a tour of Fort Lauderdale and a boat ride around the inland waterways and harbor. Because of that we were one of the first groups scheduled to leave the ship. Getting off the ship was a breeze as luggage was just being delivered to the terminal when we came off the ship and after a short wait, we found our luggage and headed to customs. This summer Val and I signed up for a Global Entry Pass and although it was a bit of a hassle to get, it was well worth it. Fort Lauderdale is the only cruise port in the US to have a Global Entry line and there was hardly anyone in it. We sailed right through customs in less than five minutes and were outside the terminal in less than fifteen minutes after leaving our room. Before we found our tour bus, we had to deliver our two large pieces of luggage to the Luggage Forward representatives as we were shipping them instead of lugging them around. This is the second time we have done this and even though it’s a little pricey, it is well worth it for us. There was a bit of a mix up finding them, and we were given wrong directions several times, but we finally found them right in front of the terminal. Because we had gotten off the ship so quickly, they weren’t there when we first exited the building. After getting rid of our large pieces of luggage, we found our tour bus and got on and enjoyed the cool, air-conditioned air. Even though it’s December, Florida was still warm and humid, even at 8:30 it the morning. We sat on the bus for a while and waited for the stragglers to wander in and then we were on our way. The tour was nice and drove us around Fort Lauderdale and gave us a feel for the culture and history of the city. After our drive around the city, we were dropped off at the harbor where we boarded a tour boat that gave us a tour of the inland waterways and harbor. Fort Lauderdale is made up of a lot of inland waterways lined with very expensive homes and lots of boats and yachts. It seemed that the main purpose of the trip was to point out the expensive homes of all the rich and famous people, which while being interesting, didn’t make me want to move to Fort Lauderdale. The boat ride was very pleasant as we were shaded and there was a pleasant breeze blowing off the water. After the boat tour, the bus picked us up and delivered us and our remaining luggage to the airport. I’m glad we took the tour even though it wasn’t as interesting as what we have been used to seeing on the trip, we did enjoy it and it helped pass some of the long wait we have before our plane leaves. When we got into the terminal, the first thing we wanted to do was check our bags, get through security, and find something to eat. Unfortunately, things didn’t work out that way because the Virgin America check-in didn’t open up until two hours before our flight. I guess there aren’t enough Virgin America flights out of Fort Lauderdale to keep the check-in open longer. We found some seats in the terminal and started our three-hour wait for the check-in to open. I left Val with the bags, and went looking for a place we could get something to eat. It seemed that all of the restaurants were on the other side of security, but I did find a Starbucks that served sandwiches so we took turns getting something to eat while one of us watched the luggage. The sandwich was actually pretty good, but having to sit in the terminal juggling our food and drinks on our laps wasn’t what I had in mind. While we finished eating, I noticed there were people in the Virgin America check-in line. We immediately got in line, checked our luggage and quickly got through security, found our gate and had a seat for the long wait. I still wasn’t feeling well and it had already been a long day so all I could think about was getting on the plane and getting home. My cough, which I hoped was going away, got worse so I went on a successful search for cough drops, but unfortunately, they didn’t help that much. We still had over four hours before our flight so we read, talked and took turns walking around the area. There were a lot of people and most of the gates were packed with people so we didn’t want to lose our seats. Time slowly passed, and it was finally getting near time to board when the dreaded announcement came that our flight would be delayed. It turned out to be only a 35 minute delay so by 7:30 we were boarding the plane. They wanted to make up time so they were hustling everybody on board and trying to get them seated. We again had opted for the economy plus seats that gave us extra legroom as well as free food and drinks, movies and priority boarding. The priority boarding is a big plus as it is such a hassle to find space in the overhead bins when you board late. The flight seemed very long and Val ended up watching two movies. I mostly read and played my Wordbrain game on my phone until we were finally landing at LAX. We made our way to the luggage pickup and saw my brother Doug and his wife Janis waiting for us, which was a very welcome sight. It didn’t take long to get our luggage and we were soon in their car heading to their house where we spent the night before driving home tomorrow. 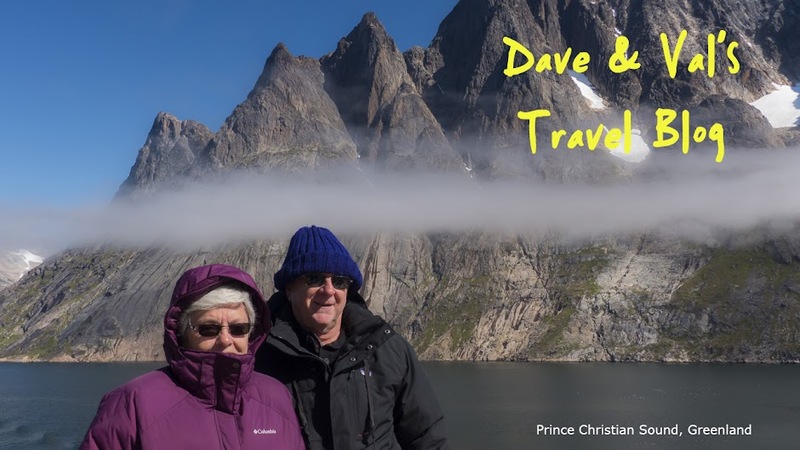 We are so grateful to Doug and Janis for picking us up; the original plan was for us to take the Flyaway bus service to a terminal near their home where they would pick us up, but while we were on the trip Janis had e-mailed me and said they would pick us up at the airport. Thank you so much Doug and Janis, you made a very long day much easier. We made the 45 minute drive to their house and we all quickly headed off to bed. We were in bed by 11:30, which was 2:30 AM EST and that meant it had been 20 hours since we had gotten up on the Veendam this morning, a very long day. By this time, we were both running on fumes and the bed felt very, very good. It will be great to get home tomorrow. I guess because I was used to being on Eastern Time, I woke up early and was up by 8:00. Val had no such trouble and slept in. Janis had an appointment this morning so I had some breakfast, read the paper and talked to Doug until Val got up. There is currently a massive fire raging in Ventura and Santa Barbara counties, which is between Doug and Janis’s home and our home in Atascadero. We thought maybe we could see them from the plane last night, but that wasn’t possible. Highway 101, which is our route home, has been closed on and off all week so our concern today was that we would have to take a more roundabout way home, but I checked when I got up and it was open. Val finally joined us and after a bite to eat for her and a little more conversation, we hit the road. We were originally going to stop in Thousand Oaks and visit my parents, but with me being sick, that didn’t seem like a good idea so we shelved that. The other thing we wanted to do was stop at Los Arroyos, our favorite Mexican restaurant. We timed it just right so it was lunchtime and we were hungry just as we got to the restaurant. It had been over two months since we had a good Mexican meal so this really hit the spot. After lunch we continued our drive north and as we approached Ventura we could see a massive plume of dark smoke ahead of us. That much smoke is unusual in a fire that is more than a week old so it showed just how massive and terrible this fire was. As we drove north through Ventura and the area south of Santa Barbara, we could see where the fire had burned down to Hwy 101 and in some cases, jumped the highway and burned to the ocean. We made it home by mid-afternoon and I can’t tell you how good that felt. We loved our trip, but being gone for almost two months is a long time, especially when you come home sick. Everything at home seemed fine, which was a relief, but we did have a pile of mail a mile high. Traveling the world and seeing new and exciting things is a wonderful way to spend your time, but as the saying goes – there’s no place like home.